With the 66th Primetime Emmy Awards tomorrow, are you ready for a totally different kind of award show for the music industry in the form of the 2014 MTV Video Music Awards. First held in 1984, let's hope the VMAs don't fall foul of the same bad publicity from vote rigging like this year's Teen Choice Awards held earlier this August. 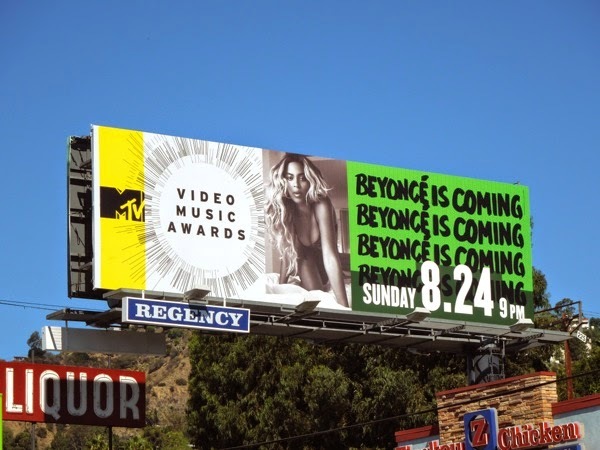 To get everyone excited for the live broadcast of the awards filmed at the Forum in L.A. today, MTV has rolled out the big guns in its ad campaign, with music icons Usher and Beyonce. 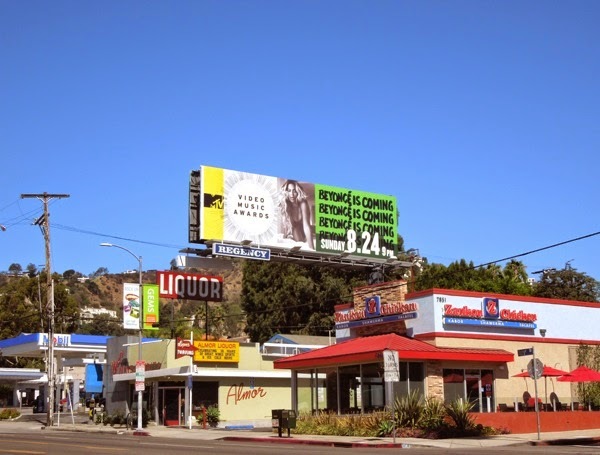 The unorthodox choice of green, yellow and white with the black and white photography of the recording artists really help these billboards stand out, although there's something about the 'Usher/Beyonce is coming' tagline that reminds Daily Billboard of the rather crude, innuendo-laden billboard teaser for the movie Ted. 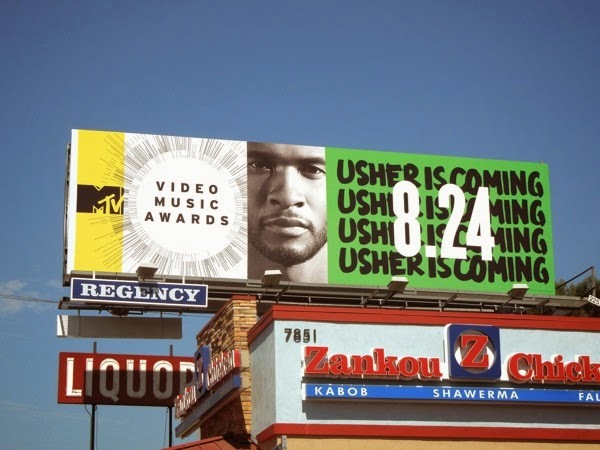 The Usher VMA ad creative was spied along Sunset Boulevard at Orange Grove Avenue on July 30, whilst the Beyoncé VMA billboard was snapped in the same location on August 16, 2014. 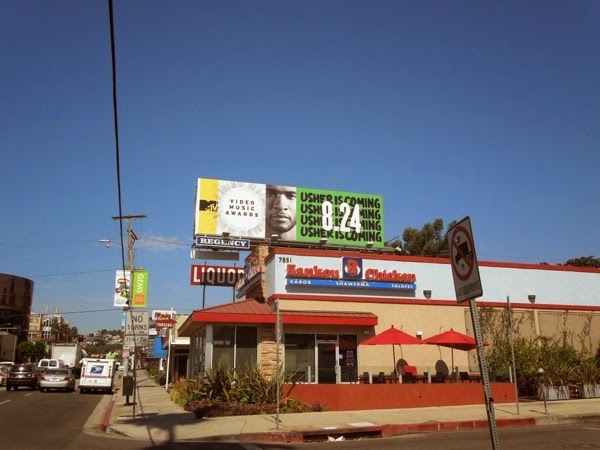 If you're a fan of the R&B artist, be sure to check out these Belvedere Vodka billboards featuring Usher and these season six billboards for The Voice. For more of superstar diva Queen Bey, check out this super-sized Beyoncé and Jay Z On the Run tour billboard and her notorious Pepsi Live For Now outdoor ad campaign. 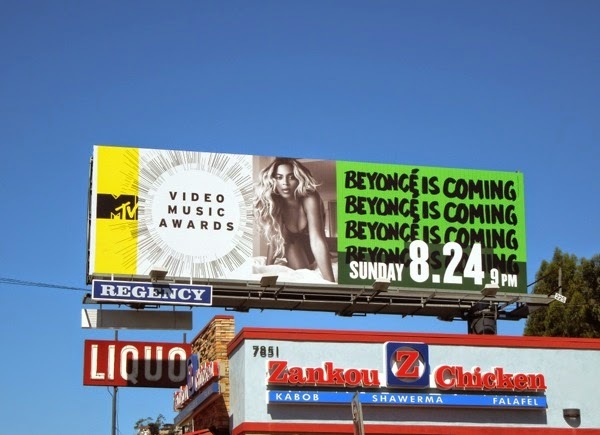 They were coming, but now the wait is over, the 2014 MTV Video Music Awards are here. Enjoy.